I have no idea what age I was when I first learned about pi, that is to say π or the ratio of the circumference of a circle to its diameter, which turns out to be a number that starts 3.1415 and goes on forever and ever and ever in a pattern-less, never-repeating type way. We certainly never celebrated Pi Day that I can recall and, for once my memory hasn’t failed me because according to a little quick research (Thanks, Wikipedia!) Pi Day was first officially celebrated in 1988, more than two years after I had already graduated from university and had deliberately stopped thinking about math concepts in any concerted way. 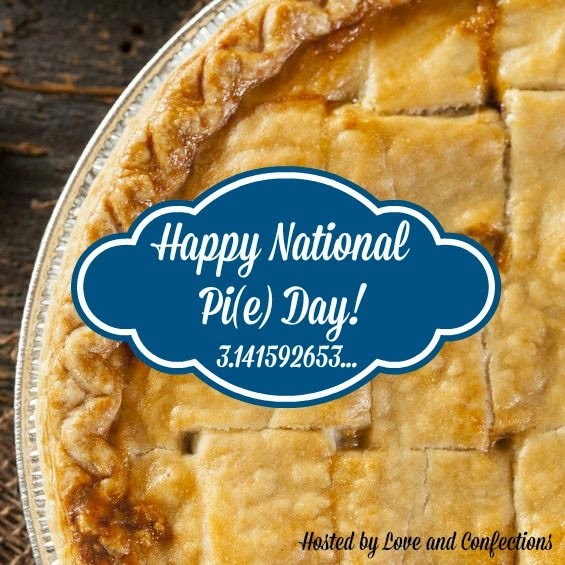 This a special year to celebrate Pi Day, because today, as happens only once in each century, is 3/14/15 - at least in the US way of writing dates month first - so I am delighted to join our pi and pie loving organizer, Terri from Love and Confections and 18 fellow food bloggers to bring you 20 fabulous pies. A note about the fruit amounts: All in all, I used a little more than two pounds or one kilo of fruit before peeling, hulling, etc. 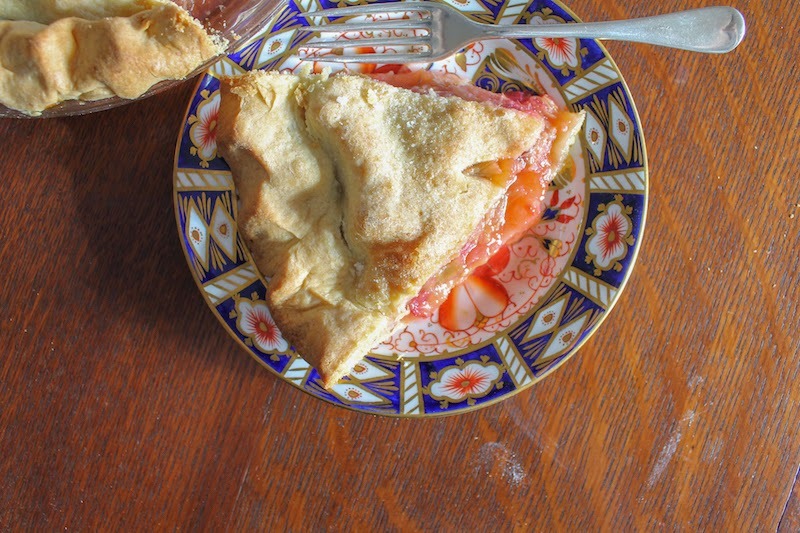 If you have less rhubarb, add more apples or strawberries. How much of each is completely flexible but I’ll give you my amounts as a guideline. 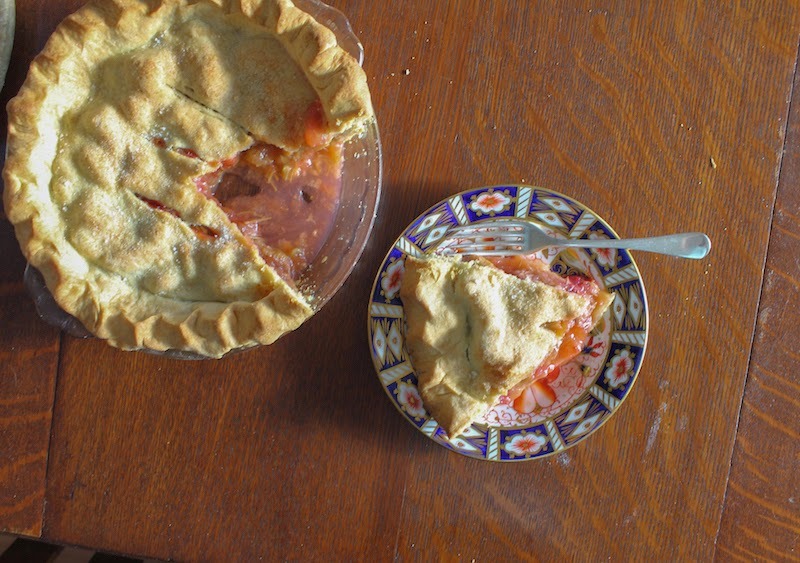 Do keep in mind if you go with all rhubarb, you are probably going to need more sugar though. That stuff is pretty tart. Double recipe of shortcrust pastry – from this link here or use your own favorite crust recipe for a two-crust pie. Make the dough for the pastry and divide it into two balls, one slightly bigger than the other. Wrap them in cling film and put them in the refrigerator. Peel and chop your apples and toss them in a big bowl with the lemon juice to keep them from turning brown. Cut the brown ends off the rhubarb, if any, and cut the stalks into chunks. Hull your strawberries and halve the big ones. Little ones can be left whole. 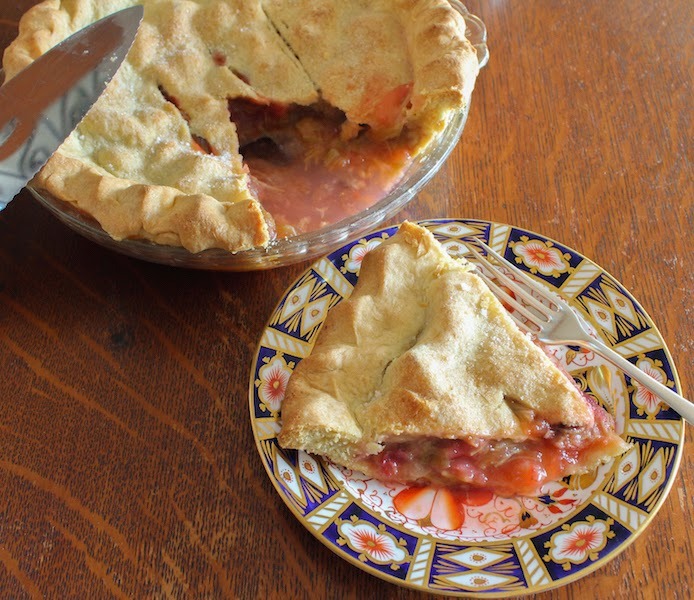 Pile the rhubarb and strawberries into the apple bowl and pour in the sugar, cornstarch and salt. Stir well. Remove the bigger ball of dough from the refrigerator and roll it out in a circle. 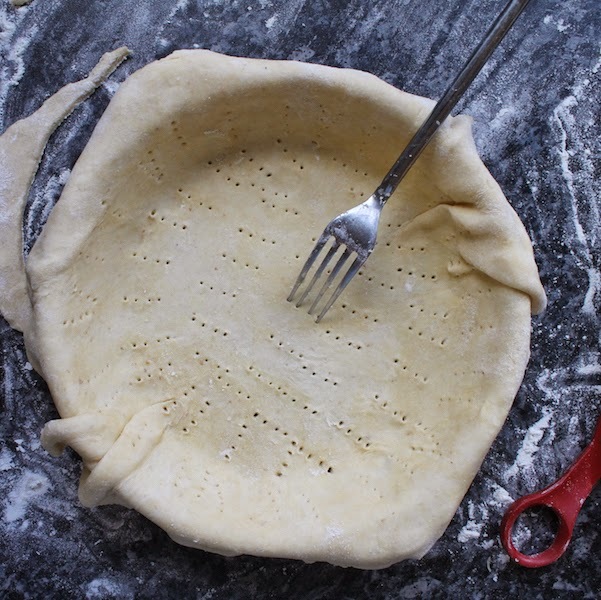 Fold it over your rolling pin and ease it into your 8 in or 20cm pie plate – not deep dish. Dock it with the tip of a sharp knife or the tines of a fork. Add in the sugared fruit and dot the top with the butter in several small pieces. I forgot the butter in this shot, but not in the pie! 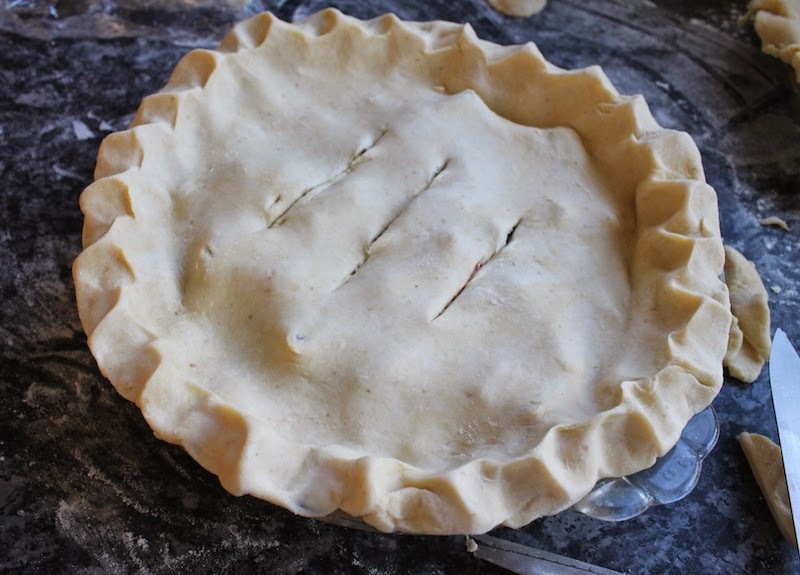 Roll out the second ball of dough in a circle and fit it on top the pie. I am a fan of shortcrust so I trim very little of the excess and fold the rest under the edges with the bottom crust and then crimp the dough all the way around the pan. If you want to trim yours more and then just stick the bottom and top together by crimping, that works too. Use a sharp knife to cut a few slits in the top to let the steam out. Brush the crust with the milk and sprinkle it with a little sugar. Bake in your preheated oven for about 50-55 minutes or until the crust is golden all over and a little juice is bubbling out the slits in the top crust. Many thanks to Terri from Love and Confections for hosting this fun event! Twenty fabulous pies to celebrate! Come join us!